Dale Earnhardt Jr. is scheduled to join the FOX NASCAR television booth as a guest driver analyst during FS1’s live coverage of The Clash at Daytona, the exhibition race that serves as a precursor to the 2017 NASCAR season, on Saturday, Feb. 18 at 8 p.m. ET. 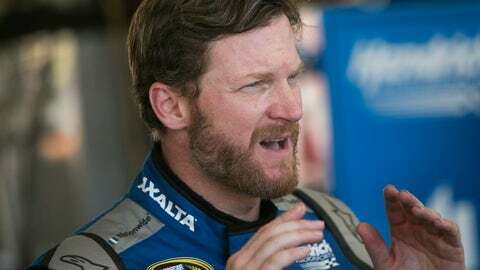 Earnhardt, a two-time winner of The Clash, will team with FOX NASCAR announcers Mike Joy, Hall of Famer and three-time champion Darrell Waltrip and four-time champ and former Hendrick Motorsports teammate Jeff Gordon. The Clash at Daytona marks Earnhardt’s second race in the FOX Sports booth. In June 2016, he served as a driver analyst for the NASCAR XFINITY Series race from Michigan International Speedway with Adam Alexander and Michael Waltrip, joining a roster of Monster Energy NASCAR Cup Series drivers to rotate in the XFINITY booth. After missing the second half of the 2016 season while recovering from a concussion, Earnhardt makes his return to the Hendrick Motorsports No. 88 Nationwide Chevrolet SS for the Duel at Daytona, live on FS1 on Thursday, Feb. 23 (7 p.m. ET), followed by the Daytona 500 on FOX on Sunday, Feb. 26 (2 p.m. ET). Earnhardt has a strong record at Daytona in Cup competition, winning four points-paying races there, including the prestigious Daytona 500 in 2004 and 2014, and scoring two victories in The Clash (2003 and 2008) and five in the Duel at Daytona, a pair of qualifying races for the Daytona 500.